Now I should say that I’m not afraid of math or anything like that. I play WoW and regularly keep up with the theorycrafting that goes on for that game. The mechanics of combat are extremely complicated to the point where maximizing dps (damage per second) requires full on simulations which can only hope to give a decent statistical model. It’s this level of complexity I often wonder about, how helpful is it really to the game? It’s very interesting to “solve the problem” but then again is your goal to design a game or a math problem? Now in a lot of ways WoW has improved in this aspect over the years. Tanking and healing are generally much more open for debate about what kind of gear is most beneficial because there are many aspects that depend on simply how one plays. For example: As a healer the amount of mana regeneration you need depends entirely on what spells you cast most often, some spells are slower, cost less and tend to be more proactive while others are fast, expensive and reactive. But alas when it comes to damage dealing there is still generally “the answer” that comes up with the highest number for a particular class or spec. 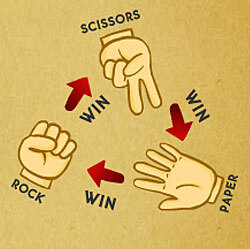 Rock, Paper, Scissors is probably one of the simplest qualitative “combat” systems. Each choice has a single quality that can vary, its type. It’s a game that’s completely deterministic yet in a way it feels random. I’m sure if you ask the people in the World RPS Society they will assure you there’s very little luck involved (Yeah, that exists). RPS is the type of game where you can really form a strategy versus someone. I once intentionally tied my girlfriend 9 times in a row because I could guess what she would do next based on recent results. I just understood how she though strategically. 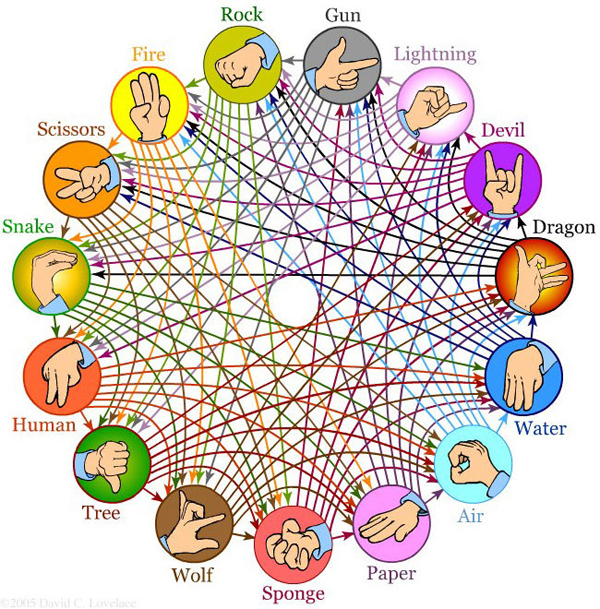 While I don’t think there’s much of a market for “Rock Paper Scissors the RPG” it’s an interesting launching point. It could definitely stand to have a little more variation and a little less randomness on the first throw. But again even different profiles of people apparently are more likely to throw different signs (there’s an infographic!). If you really think about it though, most great games of the past don’t involve much math. While people good at logical thinking undoubtedly had an edge over the years many of the oldest games are about strategy or even luck. Chess is a great example. It’s widely renown even to this day as being on of the ultimate games for the intelligent but there’s not a number in sight. In fact each piece on the board only differs in one quality from each other: movement. 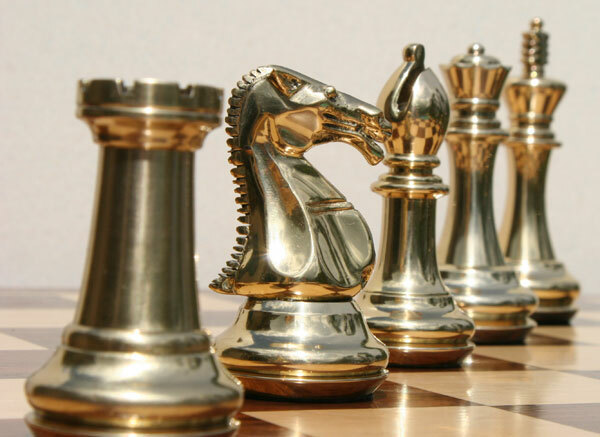 It doesn’t take two pawns to take down a rook, or three for a queen. Each piece has the same attacking strength and the same amount of life: 1. It’s not just chess either, most games that have lived through the ages have very little to do with numbers. In fact if you look at Senet, Go, Chess, and Scrabble the game about words and letters is also the one with by far the most math. I find that kind of funny. A lot of it clearly has to do with the improved education of the general public in recent years (recent as in the last century). The two areas of design are by no means mutually exclusive. 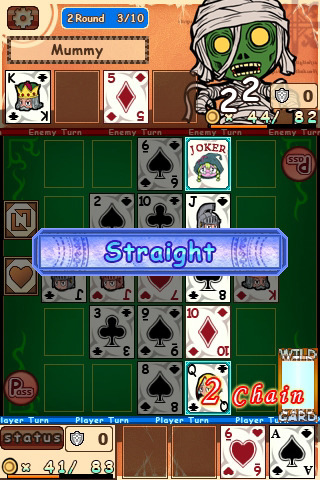 Take a deck of cards, cards which vary in two qualities. Now I’m sure there are card games out there that can play out like a game of chess, that is purely strategic, bust most involve randomization and sets. Poker being the classic example. In poker the winner of a hand is decided ultimately by the quality of one’s hand. This is what brings a lot of interaction to the table, reading your opponent, gauging the strength of your own hand. On the flip side the randomization of the cards and sets of multiple cards bring in statistics: what are the odds of making your hand if you need one card? Two cards? Maybe you’re going for a flush but could hit a lesser hand as back up? Going even further are hybrid games like Sword & Poker and Puzzle Quest. These games fully marry the two trains of thought by having classic RPG type stats with highly strategic board/card games in order to make your attacks. One of my favorite qualitative variations to RPGs are elemental types. Using a water type attack on a fire enemy might do double damage but be ineffective against other water enemies. It’s extremely flavorful and can add another element of variety to a game but even this can just boil down to be a formula if not handled right. One thing I want to explore is developing a much less quantitative combat system for an RPG. I know there are tactical RPGs but often I feel like the battles are too drawn out, not the quick duals and encounters in turn based games. It’s certainly a challenge, if it wasn’t it would probably be well established already, not to say there aren’t versions out there. What are your thoughts? What types of moves do usually like most in RPGs? What’s your favorite combat system from a game? Leave a comment with your answers! This entry was posted on Thursday, May 12th, 2011 at 6:43 pm	and is filed under iDevBlogADay. You can follow any responses to this entry through the RSS 2.0 feed. Both comments and pings are currently closed. I like your thoughts. The idea of the “coolness” factor involved in gameplay engagement/motivation vs. the mere technicality of a move, item or skill, etc.. is a great point! Have you ever checked out Jesse Schell’s “The Ar of Game Design”? He not only builds a solid foundation for game design in general, but also fives into many of the intriguing aspects of game appeal and fulfillment. Worth a check if you haven’t already! I used to play DPS caster in wow and my favorite ability was that I could maintain frost bolts through entire battles. fine tuning efficiency was a good source of fun which other games didn’t provide a platform from but my funnest move was probably ice-block because it was just strange. I think it goes to be said that minute to minute game play differs from second to second game play and it’s always a challenge to keep people engaged at all levels, I feel a tuned system like you mentioned with elemental bonuses helps minute to minute game play but second to second game play in Puzzle Quest is the ever addictive Bejeweled clone which excels at it’s task. Totally agree! I rolled a priest in WoW, just so i could mind control people off cliffs. I think RPGs (and even more so MMORPGs) use a lot more math because there are not a set number of players, so you can’t just balance the game qualitatively. You need to assign weights to each, and by doing that, things get quantitative. And with the element of luck added in as well, it models those game in which you draw cards and throw dices than something like chess. I myself was pondering the ins & outs of what would be possible with qualitative feedback for a WoW-esque game. I feel like one of the larger factors leading to my abandonment of WoW was the community that sprang up around the mathematical foundations of the combat system and spent their spare time analyzing it to death. I definitely feel qualitative games are the way to go, even when dealing with games that rely heavily on math and statistics under the hood. A qualitative approach could be used to relay information that could be processed by the gamer much more easily than a whole caravan of floating numbers in different colors and formats. Its all about the interface when you want to make a great gaming experience and I don’t want to do math in order to play a game well. The computer was made to crunch the numbers for me in the first place, why would I want that responsibility back?